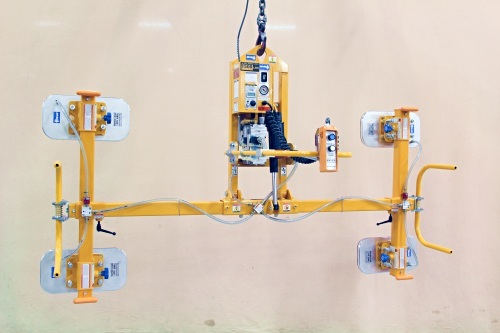 The standard Electric-Powered and Air-Powered Series Vacuum Lifters/Tilters are designed to significantly reduce the effort of upending heavy loads while providing powerful suction force and 90 degree tilt capability. 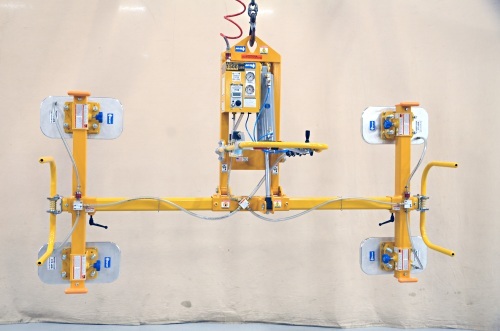 Built with safety in mind, these lifters/tilters are loaded with protective features including: a VLS System, 9V battery powered vacuum leakage sensor and warning system; an attach/release slide valve with safety lock; and locking knobs on the adjustable vacuum pad, slide assemblies, and crossarms (when applicable). The ET and AT Series Lifters/Tilters are capacity rated at a maximum vacuum level of 24 in. Hg (609.6 mm Hg) with a 4:1 safety factor on vacuum holding (unless otherwise specified). The dual filter/reservoir assembly, equipped on both electric-powered and air-powered vacuum upenders, offers a clean and reliable vacuum hold in less than ideal environments. 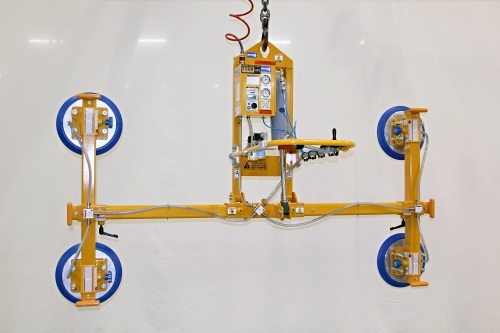 Constructed with an ergonomic lifter handlebar, a welded steel lifting frame, and end of beam positioning handles, operators can use this equipment with ease and comfort for a wide range of loads and applications. *Load weight and depth affect the final angle that the lifter achieves. Consult ANVER for ET/AT loads thicker than 1.18 in. (3cm) due to center of gravity offset. *Air Consumption is “0” on a non-porous material once the vacuum level is reached at peak value. **30 seconds continuous, 90 seconds rest.